Geranium oil is an essential oil that works wonders for tour skin and the health. Because of its aromatic smell, it is widely used in aromatherapy and has lots of health benefits. It is beneficial for all organs of your body. It is particularly good for your skin and keeps it healthy and young looking. You can extract the essential of geranium by distilling the leaves and the stems of Geranium plant. Whether your skin is dry or oily, geranium oil helps in balancing your skin and prevents it from going to extremes. Often your skin gets scars as a result of surgery, acne, chicken pox, boil etc. These make the skin uneven dull. Applying geranium oil on these marks and scars is an effective way to remove them. By applying the oil regularly on your skin you will see these scars and marks fade away. It is also good for increasing the blood circulation in the skin and ensures even distribution of melanin. Geranium oil has a very pleasant aroma that vitalizes your senses. If you apply this oil on your skin, this aroma of the oil remains on your skin for a longer time. It may be used as a deodorant. It is also very mild and do not harm your skin in any way. The anti-bacterial properties of the oil help in eliminating body odors. In contrast to other deodorants, geranium oil is circulatory oil, which means that its aromatic smell is more when you sweat. So, the more you sweat the better the smell of geranium oil. 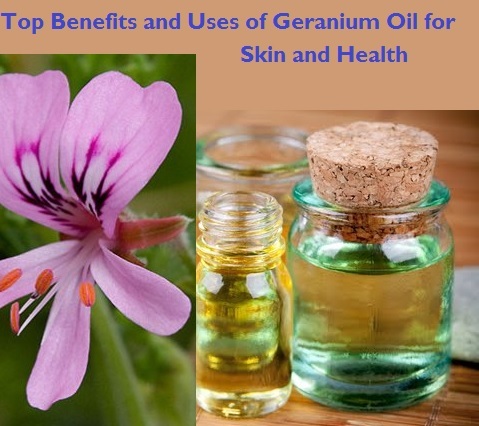 Geranium oil has the property to relieve your skin from water retention and swelling. So it is excellent for puffy eyes. Geranium oil is a good skin tonic and can be used to tone your skin. It ensures that all your body systems work properly. It also stimulates the endocrine glands that are responsible for regulating the secretion of enzymes, acids and hormones in the body. As a result the functions of various systems like digestive, respiratory, excretory, nervous and circulatory systems are improved. This leads to a better toned skin and reduce acne, dermatitis and other skin diseases. The complexion is also increased and you will have a radiant skin. You must dilute the oil with carrier oil and then apply it to the skin. You can also add it to the water you use for bathing. Another way is to inhale the oil by taking a few drops of the oil on a piece of cloth. You must avoid taking it internally as it may have toxic effects. It is also advised that pregnant women must not take this oil unless it is prescribed by a doctor. Geranium oil is excellent for the contraction of different parts of the body. Muscles, gums, intestine, tissues, skin and blood vessels are made to contract with the help of geranium oil. The gums are made to contract and this protects your teeth. It also causes contraction of abdominal muscles and provides you a better toned look. The skin is also made to contract and thus you can avoid sagging of the skin. If you apply this oil on your face, you can avoid the formation of wrinkles and premature ageing of the skin as it helps in contracting and tightening the skin of the face. It is often included in skin firming creams and lotions. It is great for people who are depressed. This oil contains anti-depressant properties which help in soothing and relaxing your nerves. It is also beneficial for symptoms that trouble you during the periods of menopause and after that. If you have any wound, apply this oil on the wound and it will keep it from getting infected by preventing the growth of bacteria and other microbes in the wound. It also enhances the immune system, so that the cells that defend the body are all set to attack the foreign bodies and destroy them rather than get weakened by the presence of toxins in the skin. Geranium essential oil helps in removing dead skin cells and regenerating new cells. It improves the metabolic activities so that the cell growth and the gamete growth are increases. Geranium oil is very beneficial; for increasing the process of urination and thus helping in the removal of harmful toxins from the body. Some of the toxins that it help in removing are uric acid, bile salts, pathogens, synthetic substances, chemical substances, sugar, fat, pollutants and heavy metals. If they are not removed properly from the body, they may cause many health hazards. Urination is also necessary for the proper digestion of food substances. It also reduces blood pressure and prevents the formation of excess gas. Geranium oil is used to prevent hemorrhaging and stop the flow of blood from any cut or wound caused on your skin. This is because geranium oil is an astringent and can cause the contraction of blood vessels, thus preventing the flow of blood. Moreover, having haemostatic properties, it can enhance the coagulation of blood and blood clotting, thus healing the wound and preventing the entry of various toxins and microbes into the blood stream from outside. This property of geranium oil is made use of in healing wounds and incisions made by surgery. Moreover, its haemostatic, antibacterial, cytophylactic, antimicrobial properties make it excellent for healing the wounds without getting them infected. If you are suffering from worms in the intestine, geranium oil can help you get rid of the worms. This is particularly beneficial for children as they are more prone to intestinal worms.